It’s one of the little-known secrets about saving money on a cruise… and it can save you a lot of money. The market for hotels is always competitive, especially in Mobile, Alabama. As a result, many hotels will offer perks in order to attract more guests. And with a major cruise port in town that brings in guests from all around the region, that means offering parking packages that include free or discounted parking as a thank you for booking. Parking can be a pretty hefty price on top of your cruise fare. Fares run $18 a day at the Alabama Cruise Terminal. That means for a 5-day trip, you can expect to pay $90 for parking. 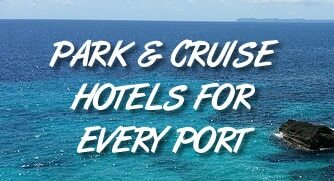 But if you are staying in the area, then you can find a hotel that offers a cruise parking package. These packages include parking in your hotel fare, typically for an amount that’s a little more than the regular room rate, but less than parking at the cruise port. In addition, they will often include transport back and forth from your ship. To be sure, if you don’t plan on staying at a hotel the night before, then doing it just for the parking isn’t worth the added expense. But if you are going to stay somewhere, we suggesting finding a place with cruise parking to save some money. We’ve rounded up a list of hotels in the area that have parking packages for Mobile cruisers. Prices are for a search for a recent Saturday night stay and are subject to change. Click each hotel name to read recent reviews from TripAdvisor.com. For parking packages you may have to book through the hotel website, which is linked on TripAdvisor. The Admiral Hotels offers a “Park, Stay, and Cruise” package for its guests. About $30 more than the lowest base rates in our search, the package includes complimentary breakfast for two and free parking while you take your cruise. The hotel’s “Park, Ride and Cruise Package” includes room accommodations, parking for the duration of the cruise, and round trip transportation to the cruise terminal. Note that the transportation is through a third-party but billed through the hotel and included in the package. Similar to the Courtyard Marriott mentioned above, this package includes guest room accommodations, complimentary breakfast, parking for the duration of the cruise, and round trip transportation to the cruise terminal. One of the few downtown hotels offering a parking package, the Hampton Inn includes one night’s lodging and parking at the cruise terminal for one vehicle for the duration of your cruise. Complimentary breakfast is also included. You can book directly with the hotel here. Includes parking for the duration of your cruise and round-trip transportation to the Alabama Cruise Terminal. Guests will call and arrange their own transportation by calling Derek’s Taxi Service. Includes parking for the duration of your cruise and round-trip transportation to the Alabama Cruise Terminal. According to the hotel’s website, guests will call and arrange their own transportation through Derek’s Taxi Service. Similar to the TownPlace Suites and Residence Inn, this package includes parking for the duration of your cruise and round-trip transportation to the Alabama Cruise Terminal. Guests will need to call and arrange their own transportation by calling Derek’s Taxi Service. As with other packages, this one includes parking for the duration of your cruise and round-trip transportation to the Alabama Cruise Terminal. Guests will need to call and arrange their own transportation through Derek’s Taxi Service. Located in Saraland, Alabama, this hotel is about 10 miles from the cruise port. The parking package rate increases slightly for the summer season, but is still a pretty good deal versus parking at the port. It offers parking for the duration of the cruise, and a shuttle for up to four people is included with the package.